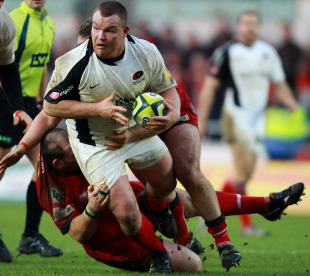 Saracens prop Matt Stevens is set to resume his quest for an England recall when he links up with the Saxons on Monday. The 28-year-old, who played his last Test in November 2008 before serving a two-year drugs ban, has been earmarked to start in his preferred tight-head position in the Saxons' forthcoming Churchill Cup campaign. He believes he has "every chance" of forcing his way into Martin Johnson's plans for the World Cup, just 12 games into his return to Premiership rugby. "I am joining up with the Saxons on Monday and I have been told that is a big chance for me to prove myself," Stevens said. "Tight-head is my preferred position and that is where they want me to play for the Saxons. The ball is in my court. I have just got to perform well." Stevens will link up with the Saxons two days after playing for Saracens in the Premiership final against Leicester - and 24 hours after an England XV take on the Barbarians. Bath-bound lock Dave Attwood is due to start Sunday's non-cap game and, like Stevens, he too has some ground to make up after a stamping ban ruled him out of the Six Nations. "I don't have a nasty track record. It is not something that has plagued me throughout my career," he said. "I had a run-in in the summer in Australia and again in December. It is something that has come about but it has not been a feature throughout my career so far. "I am not worried it will creep more into my game. I will just keep on top of it and not step over the mark. This game is massive for me. The second half of the season wasn't what I was hoping for given how well the first half went for me. I am on the back foot, I am aware of that, but having broken back into the Gloucester team I feel my form is coming back." Martin Johnson spoke with Attwood after the ban and he remained part of the squad that helped England prepare for their Six Nations title success. "We talked about the consequences really, it was more of a practical nature than a mental assessment. We talked about the implications of what had happened," he said. "It was a case of how they could use me in supporting the team throughout the Six Nations period. "I certainly didn't feel out of sorts in that England environment. I think some people took to me in the way I handle myself and go about my business. Hopefully I can squeeze myself back into that environment."